All Emmylou has is her band. She's attending college to please her mother but her band is what she truly lives for. She has always had a strict rule of not getting romantically involved with her bandmates but one drunken night turns into a big mess when she sleeps with Travis. Travis has been her bandmate and basically her best friend for a couple years and she is suddenly faced with the decision of whether to pursue this or nip it in the bud. The only problem is that every time she tries to talk things over with him she puts her foot in her mouth and makes things so much worse! There is so much to love about this story. The music scene was perfectly described and had me envisioning the stage and performances in my mind's eye. Emmylou had me at the edge of my seat watching and waiting to see what she would do next while she tried to navigate through love and life. I got very emotional during a couple of scenes due to the intense situation and I was just aching for her. Travis was so AMAZING! I'm completely and utterly smitten with him! From the beginning I knew I would love him and I did! 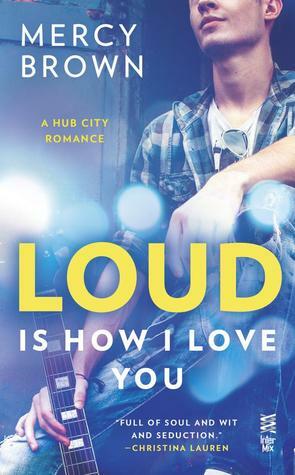 Loud Is How I Love You is a great start to the Hub City Series and I'm excited to continue on with these musical characters.